The Game Played In Heaven. 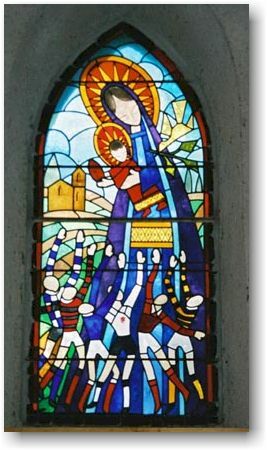 At the Notre-Dame-du-Rugby in France, one stained glass window has the figure of the Virgin Mary with a small boy in her arms and a rugby ball is in his hands. At their feet, players are jumping in a line-out. Unlike the game played in heaven, giving church a try does not a convert make. After all, I’d ‘popped along’ to a few church services in my time and, whilst I especially adore the energy of the midnight Christmas service, it hadn’t moved me enough to do much else. So, in the spirit of open-hearted research, I decided I’d get myself along to a Sunday service. I’m at pains to point out that the smart-alec pastor (SAP) at no point hustled me along to his church. Which (as a business owner) now makes me wonder about the key performance indicators (KPIs) for successful pastors. I must ask him if they work on a percentage rate. Trys: 60. Conversions: 6. Dip below ten percent and you’re under a performance review? So, anyway, there was no car salesman approach. But that religious hangover of mine made me a tad wary. I recall writing that IF I ever came along, to please not put me near any scary Christians. I also recall deleting that line, then re-writing it, then deleting it, then re-writing it…..before pressing send. Now I’d done it. Deep-down I did want to go. Underneath all my pre-conceptions I experienced a real pull. But, oh, the nerves. What if I took the Lord’s name in vain (which I’m afraid I do regularly) and offended someone? Stood (or sat) at the wrong time; forgot to follow the script? All this based on memories of a very confusing Catholic Holy Communion I attended for my niece years before. I felt I’d entered the religious equivalent of a Les Mills Body Attack class where I was hopelessly inadequate at keeping up with all the moves. I had mistakenly worn leather pants for that occasion too. Each time I moved, I squeaked. Note to self: find appropriate outfit before Sunday. N.B. : Read more about the Notre-Dame-Du-Rugby. I’m not kidding!